The Australian Little Athletics Championship (ALAC) is a State/ Territory teams event for the Under 13 Age Group, and an individual multi-event championship for the Under 15 age group. Athletes will be selected by the LAACT following the LAACT Championships. Athletes wishing to be considered are required to meet a number of pre-qualification requirements. These requirements will be provided to athletes in these age groups during the season. Little Athletics ACT offers three main competitions through the season. Events on our competition and practice days occur in specific locations. 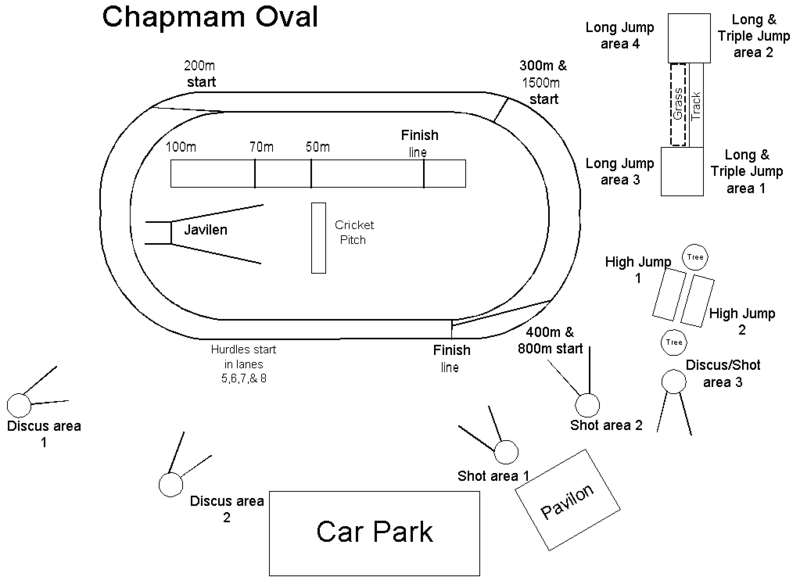 Here is a map of the field layout. The cancellation of any competition day will be decided by 8am on Saturdays or 4pm on Fridays and posted on the website, as soon as possible after a decision. Alternatively parents can call ACT Government on 132281 and ask for ground closures or 6207 5957 for a recorded message. Local radio stations will also be advised to post on community bulletin and general announcements. Weston Creek Little Athletics endorses the alcohol and drugs policy adopted by the ACTLAA. Achievement tickets are awarded for each event in which an athlete competes during the club season. These tickets should be pasted in their personal performance booklet. Centre colours are red and black and the official competition uniform consists of a red (and black) T-shirt emblazoned with the Redback logo complemented by black shorts/skins. A red and black singlet, red and black crop top or red and black body suit are permissible in lieu of the T-shirt as official competition uniform, However, being mindful of the Australian weather, WCLAC requires athletes to wear T-shirts when not competing in an event. Uniform T-shirts, shorts and club jackets ($TBA) can be purchased or ordered from the canteen. However singlet and crop tops are not offered for sale by the Centre. In all competition outside the Centre (e.g. ACT Carnivals & Championships, etc), the official Centre Uniform must be worn. This will include an age patch, registration number, and any current sponsor’s logo. For carnivals outside WCLCLA, competitors will not be allowed to take part in any event if they fail to comply with the uniform rules.